Taking over a former dry cleaning space at 3017 Adams Avenue is a gelateria aptly named An’s Dry Cleaning, set to open Spring 2018. Sited between Hawthorn Coffee and Tajima Restaurant, An’s Dry Cleaning is a gelato shop heading to the culinary forward corner of Adams Avenue and 30th Street next Spring. The shop will pay homage to the classic American dry cleaner in its design, finishes, and layout. An’s (pronounced Ahn) will draw inspiration from the prior establishment to create an environment where asking for extra starch no longer references crisp shirts but rather a pressed waffle cone, and clothing colors and dry cleaning services stand in for traditional flavor names. Unwilling to sacrifice quality, An’s will serve gelato out of a classic, but now less common, Pozzetti case. Hidden away in deep canisters, the gelato is better protected by maintaining the optimal temperature. 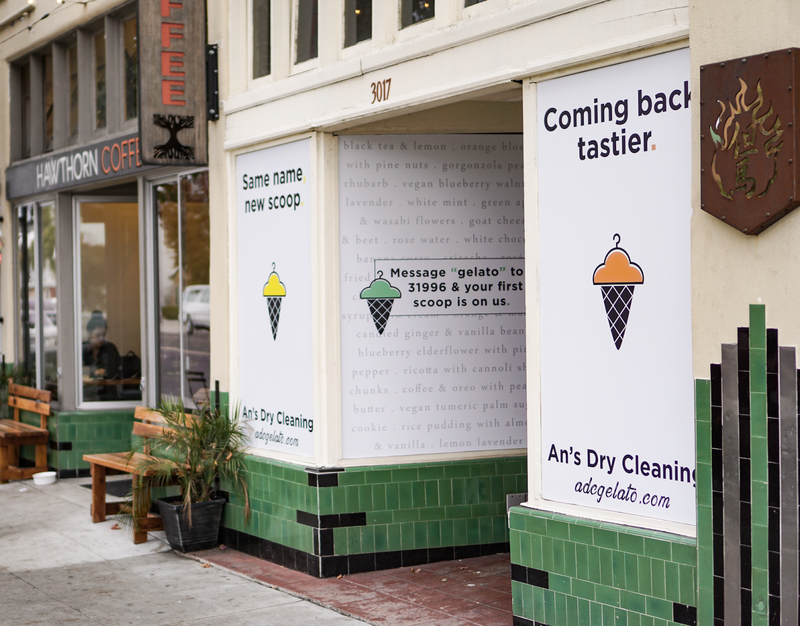 The An’s Dry Cleaning experience will begin with an off-menu palate cleanser and proceed through a tasting of seven rotational flavors designed to be experienced in a specific order. Whether a stark contrast or surprisingly complimentary, each new flavor is chosen to engage and educate the guest. Sourcing ingredients from local purveyors whenever possible, An’s will use traditional and non-traditional flavors such as goat cheese, cactus, or even wasabi flowers to create unique offerings that never include artificial preservatives, flavors or colors. The gelato will also be used to create gelato cakes adorned with beautifully carved fruit, available for take-out. A passion project years in the making between longtime friends, An’s rotational menu of flavors will be created on-location by a seasoned gelato maker (also known as gelatiere), bringing with him over a decade of experience in pursuit of the perfect gelato. His gelato is a delicately textured mix of milk, cream and sugar, yet still contains less fat, sugar and air than ice cream. 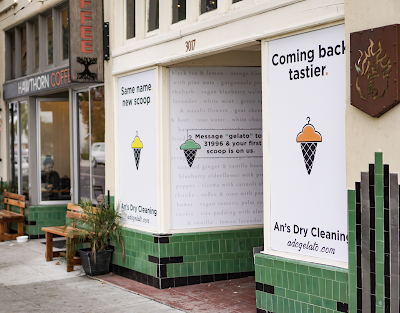 Prior to opening, the An’s Dry Cleaning team will host tastings to determine the starting lineup of flavors for those who sign up via their website at adcgelato.com.